Arthur A. Levine Books, 9781338134087, 272pp. Hester Greene loves making movies. With her camera in hand, she can focus, make decisions, and have the control she lacks in life, where her executive function disorder (think extreme ADHD plus anxiety) sabotages her every move. 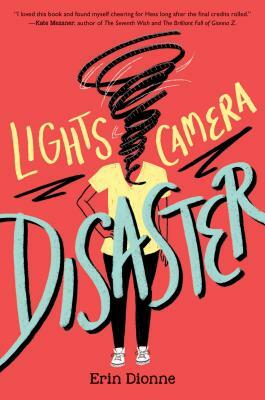 But middle school is not a movie, and if her last-ditch attempt to save her language-arts grade--and her chance to pass eighth grade, period--doesn't work, Hess could lose her friends, her year, even her camera. It will take more than a cool training montage to get her life together, but by thinking outside the frame, she just might craft a whole new ending. Written partially in script form, with STOP/PAUSE/PLAY/REWIND moments throughout, this laugh-out-loud story will speak to any budding filmmaker, or unintentional troublemaker, in every act of their lives. Erin Dionne is the author of five other books for kids, some of which are funny (such as The Total Tragedy of a Girl Named Hamlet), and some of which are mysteries/adventures (such as Moxie and the Art of Rule Breaking). Like Hess, Erin loves action movies, especially Star Wars and The Avengers. Wonder Woman is her favorite superhero. She lives outside of Boston with her husband, two kids, and a very disgruntled dog. Visit her online at erindionne.com.